Click ‘Donate’ and choose how much you’d like to give. Card payments can be made through Paypal or contacting the club office on 01244 371376, Mon-Fri 10am till 4pm; please state your desire to donate, when you call. 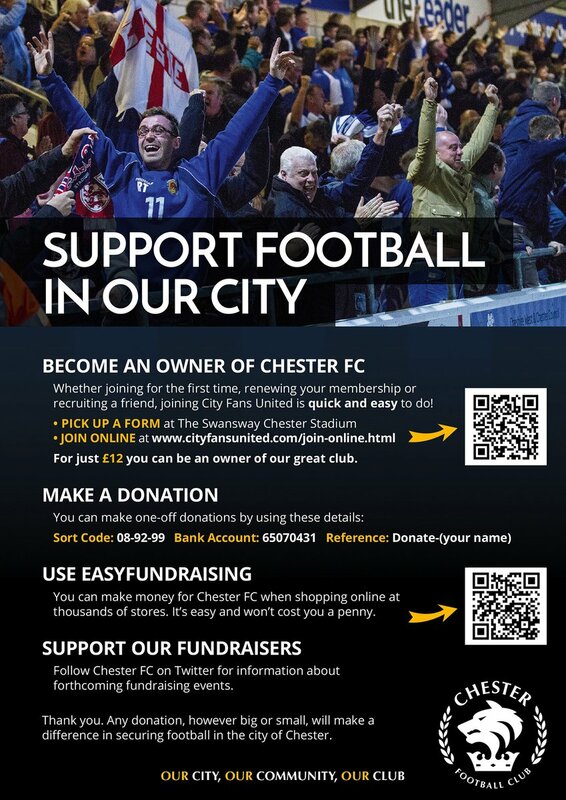 Join City Fans United: For £12 a year you can become a member of City Fans United and a co-owner of Chester Football Club. You can join online at www.cityfansunited.com/join-online.html or visit the ticket office at the Swansway Chester Stadium. Fundraising: We need your ideas, suggestions and offers of assistance so please email fundraising@chesterfc.com or call 01244 371376 and help us win this fight. Together – and only together – we can do this!